1927 witnessed a curious new addition to the rear of the Twickenham South Terrace. A little known company called the British Broadcasting Corporation was granted permission to construct what looked like a bird-hive on top of the fence at the back. The strange wooden cube, accessed via a short ladder, was greeted with utter bemusement by fans prior to the 1927 England Wales match. Little did they know that they were witnessing history in the making. 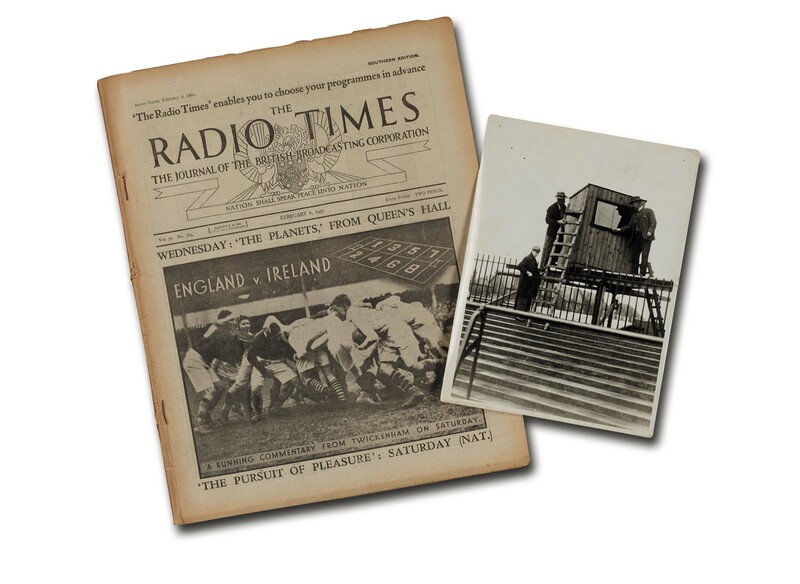 Twickenham was about to play host to the first ever live radio team sports commentary broadcast. 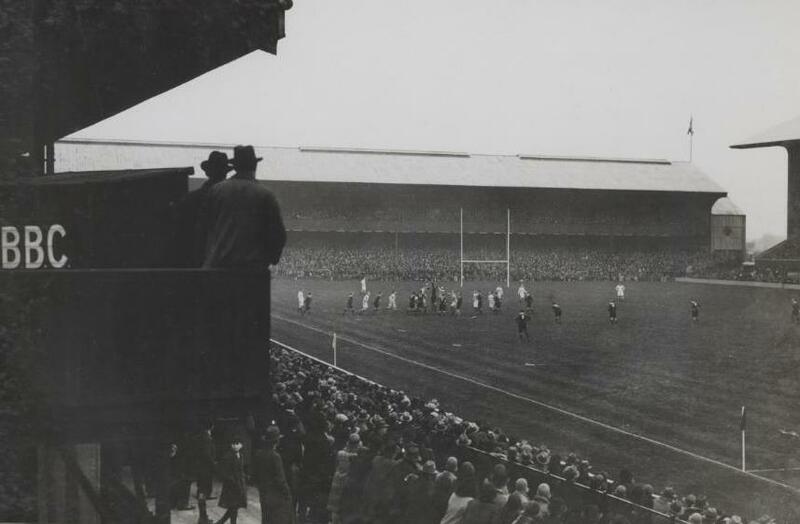 England won the game by 11 points to 9 and if any of those clustered on the South Terrace had taken a break from the game and turned around they might have seen a strange man, wearing a large pair of headphones, leaning casually against the wooden box. Inside, behind the microphone, was former Harlequin Teddy Wakelam. Wakelam had been given one firm instruction by his employers before the broadcast began. The words “don’t swear” were pinned at eye-level on the inside of the wooden commentary box. The following week he would deliver the first live football commentary and he covered test cricket and Wimbledon later the same year. In those early years Wakelam was the voice of British sports broadcasting, but he would go on to become synonymous with rugby, a game that he loved. He went on broadcasting right up to and beyond the Second World War. Before 1939 Wakelam pioneered a technique called ‘grid commentary’. It relied on The Radio Times to provide a reference card which divided the Twickenham pitch into a grid. The listener would place the card in front of the wireless whilst listening to the game. Whilst the game was in play, Wakelam would refer to the position of the ball by its position on the grid. The technique, abandoned after the Second World War, was the norm up until 1939 and added the phrase ‘back to square one’ to the national lexicon. 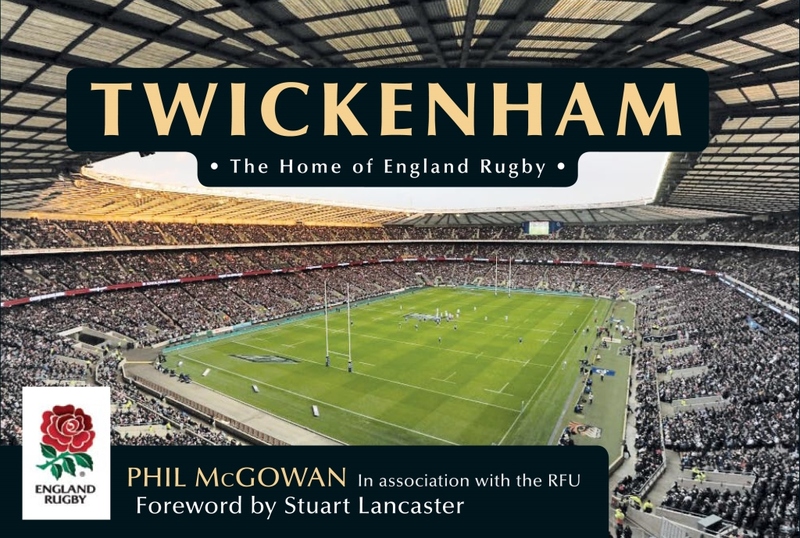 About the Author – This article is an extract from the book ‘Twickenham: Home of England Rugby’ available from Amazon. Phil McGowan has been a member of the World Rugby Museum team since 2007.